A little of what Nova Scotians see and feel. Video/film by Cliff Seruntine, Sep 12, 2018. 28 minutes. Water cycles, effects of clearcutting.. wonderful photography. Post on this website Dec 9, 2017; it introduces the HFN page with Scott’s aerial views taken in the early summer of 2017 in Annapolis Co. and Cape Breton. Cliff Serentine, Oct 18, 2016. Cape Breton. 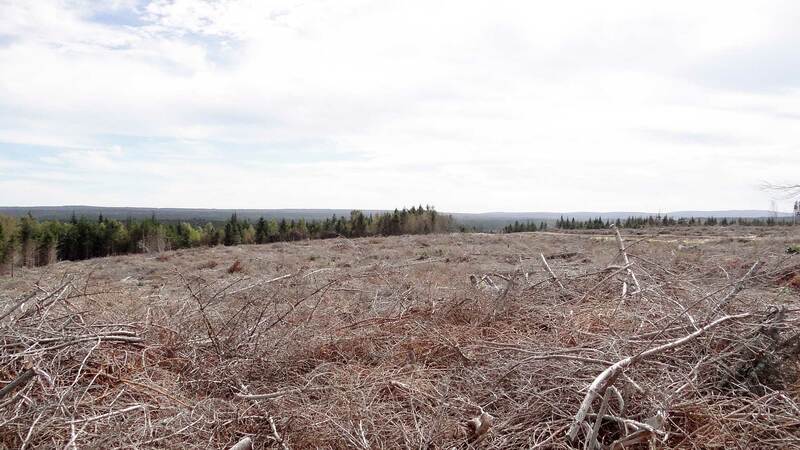 Large, remote clearcuts in mature Acadian forest, with disregard for watercourses, removal of habitat. Cliff Seruntine, Aug 7, 2017. 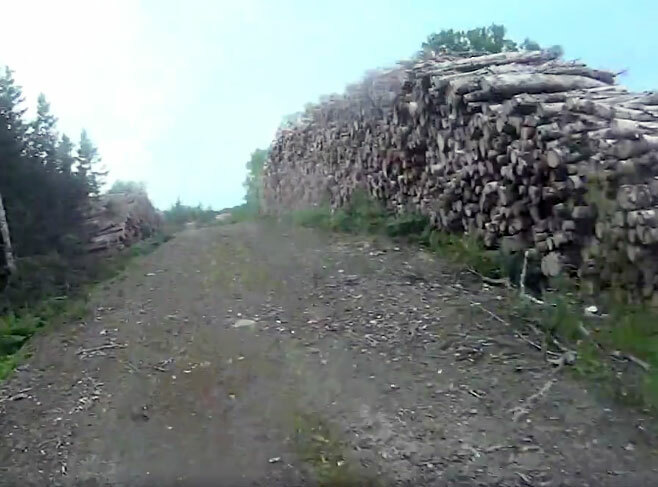 The video illustrates the stark contrast of mixed Acadian forest (with one hemlock close to 5 ft diameter), with clearcut forests managed for softwood. Cliff Serentine, Sep 29, 2016. Cape Breton. Video of clearcut at Higgins Mountain, Cumberland Co.
kathydidkowsky1. “This video walks you through one peaceful forest in Caribou Gold Mines, Nova Scotia, Canada, that was turned into a wasteland by industry. By RobertDevet in The Nova Scotia Advocate, October 22, 2016 Video by Dave Thomas. A weekend video with a difference. No story line, no sound, no people, just images from a drone flying high above the Cape Breton Highlands. Photos by Jamie Simpson, 2009. Photos by Jamie Simpson, 2010. Facebook Page. Photos are from the Facebook Page. The top photo depicts a portion of a large clearcut that effectively isolated two of the three parcels that make up the Old Annapolis Road Nature Reserve. The cuts went right up to the borders of the Nature Reserve. The two-parcel, 100 acre +, clearcut was a mere fraction of what had been proposed; over 800 acres of cuts from several different parcels. Luckily, the majority of these proposed cuts were “deferred” when the St. Margaret’s Bay Stewardship Association voiced concerns over the impact on the local community use and ecology. Unfortunately, “deferred” does not mean that these proposed cuts are out of consideration just yet. Connectivity is key in order to support ecological systems and allowing our Nature Reserves and Wilderness Protected Areas to function as they were intended. The proposed Ingram River Wilderness Area provides just that! Photo 2: From Pogwa Lake to Piney Stream, the proposed Ingram River Wilderness Area contains some of Nova Scotia’s most pristine and unprotected forests as well as incredible opportunities for outdoor recreation and exploration. Comment by JR: I grew up in ingramport swimming at the base of the river, hiking and camping the trails along the river and fishing the river further up. This was my place growing up and I still do the same things to this day. This is an amazing piece of wilderness and deserves to be protected. The amount of damage that has been happening around this area over the past few years from clear-cutting to highway/road expansion is saddening but there is nothing that can be done about that now. I’ve lost trails that I used to hike and places I used to sit and think due to the new construction but this initiative to create a Ingram River wilderness area that is protected will hopefully save some of the gems that this area holds. If you haven’t spent any time in the wilderness around Ingramport I encourage you to see how beautiful the wilderness is back there. One positive about the new overpass was that this area is more accessible to people who want to use it. Hopefully it will stay as pristine as it is now with the added traffic.